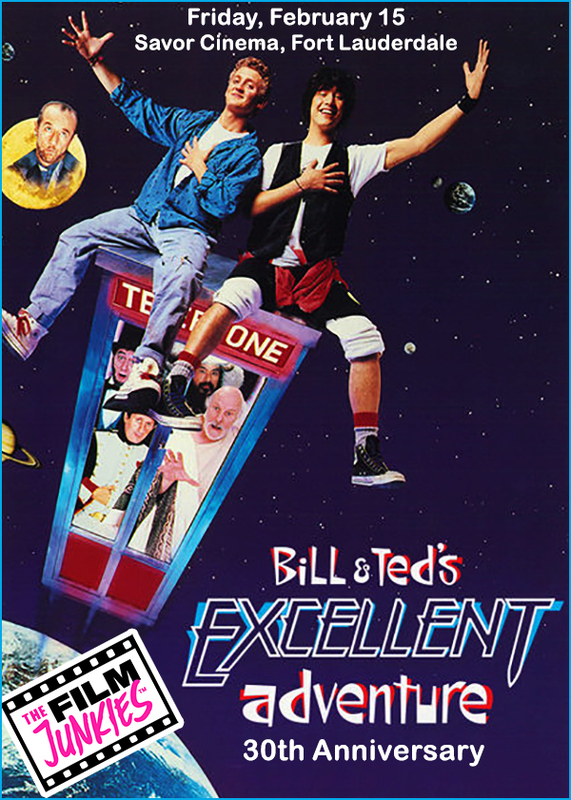 Home » EVENTS » Bill & Ted’s Excellent Adventure: 30th Anniversary Screening! BE EXCELLENT TO EACH OTHER. On Friday, February 15th at 10pm, The Film Junkies and Savor Cinema are celebrating the 30th anniversary of the 80’s most-triumphant film, “Bill & Ted’s Excellent Adventure”. Join us for this Post-Valentine’s Day Bromance of the ages as we follow Bill S. Preston Esq. (Alex Winter) and Ted “Theodore” Logan (Keanu Reeves) through time so that they can deliver the most excellent history report, EVER! Come dressed as your favorite historical figure (or Bill & Ted themselves) and you could win an awesome prize. 8pm-1opm: Miami Grilled Cheese Food Truck will be set up in front of Savor Cinema, selling a variety of fresh, gourmet grilled cheese sandwiches. Sit and enjoy the ultimate comfort food while viewing classic Bill & Ted animated episodes on the Savor Cinema patio. Also, grab a drink at Savor’s full bar.